Fetal movement is by far one of the most unique things that I have ever experienced in my 33 years of life. At nearly 33 weeks pregnant with my second child, I have been feeling baby movement for quite a while now. They say you usually feel movement a bit earlier with subsequent children, and “they” were right. 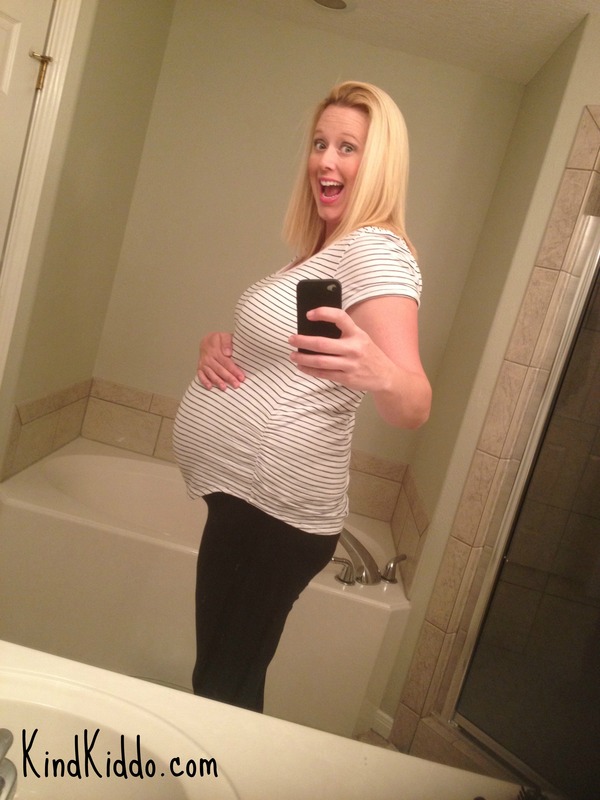 I was still in my first trimester when I felt just an itty-bitty tiny little move inside of me. And this gal in my belly has gotten stronger and stronger as time has passed. So strong, in fact, that it’s the root of my what-am-I-in-for-with-this-girl jokes. For those of you that have yet to feel fetal movement, and for those of you that have but want to compare notes, here are my honest thoughts on the whole thing. I remember being pretty terrified when I was pregnant with my first baby. I hadn’t been dreaming of pregnancy since I was 5 years old, and I didn’t have a whole heck of a lot of exposure to babies in general. So although I was thankful to be sharing something so incredible with my BFF/Husband, Ryan, I was still…scared. So just imagine my reaction to fetal movement. What? There’s a what inside of me? It freaked me the hell out. I remember when I first started to feel my little boy moving in there. Did it feel like butterflies? I mean, maybe. I’m not sure what butterflies would actually feel like inside of my belly (there’s another freaky thought for you), but I guess they might sorta feel like the soft fluttering feelings of a tiny little baby. It wasn’t so terribly scary at first because it was soft and subtle. But as time moved on and he got stronger, it got a little wilder. It’s almost like it’s a way for your body to remind you that you’re pregnant. I guess some chicks don’t really need a reminder, but there are days when you’re feeling good and you’re distracted and you kinda forget that there’s another human inside of you. But all it takes is a little KICK or PUNCH in the belly or ribs to remind you of your current reality. I recall one particular bit of movement with my first that literally made me jump in the seat of my car while I was driving. It was pretty major. This time around, not only did I start to feel movement earlier, but there’s certainly more of it. This little girl is busy. And as weird as it truly feels sometimes, I’m grateful that she’s so busy. It keeps me in the present and is a nice little way to make me feel like she’s doing okay in there. You eventually get to a point where you not only feel the strong movements, but you can actually see your belly moving. So, what does fetal movement actually feel like? Fetal movement. I know it’s nice to have a comparison, but I really can’t come up with one. Butterflies? Maybe – but only at first when the movement is soft. Gas? Sure – I guess early movement can sorta be compared to a gurgling tummy. An alien? Yeah. I can see how it would be compared to an alien, but that freaks me out more than a human, so let’s just not go there. Bottom line – it just feels like a baby moving inside of your body. That’s it. It truly is weird, wild and wonderful. And no matter what, it’s some pretty cool shiznit that an actual human being has been forming inside of your body. I mean, come on. Even us gals that claim to be “not baby people” can appreciate that fact.